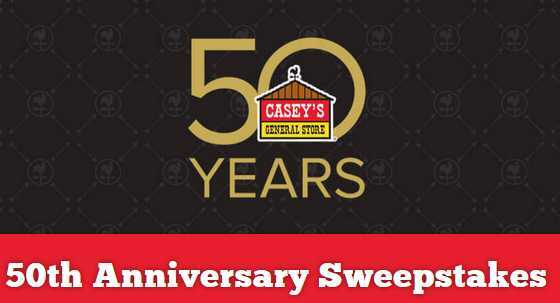 Enter the Casey’s 50th Anniversary Instant Win Sweepstakes Contest now through August 31, 2018 for your chance to win instant win prizes such as Apple iPad, Apple Smart Watch, GoPro Camera, Gift Card and much more and there are one grand prize winner in this contest who could win $50,000 cash prize. Make a Purchase: During the contest period visit any Casey’s store and make a purchase and find a Caseys.com contest code on the bottom of your receipt. Once you obtained the code then go to www.caseys.com and find the page giving the online playing form. Use the code while completing the online form to see if you are an Instant Winner. Without Purchase: Mail an SASE (hand printed“ self-addressed stamped envelope”) inside a no larger than #10 envelope to: Casey’s 50th Anniversary Sweepstakes Code Request, PO Box 6050, Clear Lake, MN 55319. Prizes: One grand prize winner will win $50,000 which will be awarded in the form of check; Instant Win Prizes:Apple iPad with WiFi 128 GB, GoPro Camera Hero 6, Apple Watch Series 3 GPS 42mm , Crashed Ice Jacket, Amazon Echo, $100 Bank Gift Card, Monster Backpacks, Monster RC Slash Remote Control Truck and many other exciting prizes available to win. Who Can Enter: The Contest is open to legal residents of Arkansas, Illinois, Indiana, Iowa, Kansas, Kentucky, Michigan, Minnesota, Missouri, North Dakota, Nebraska,Ohio,Oklahoma, South Dakota, Tennessee and Wisconsin and must be (18) years of age or older. When To Enter: The Sweepstakes entry begins at 12:01 am Central Time (CT) on July 01, 2018 and ends at 11:59 pm CT on August 31, 2018.